The Algerian masterpiece remains one of the most relevant films of our time for good reason. Released in 1966, just four years after Algeria’s independence from France, The Battle of Algiers has remained a classic of political cinema. It is one of the most powerful depictions of people’s struggle to be free; capturing the struggle, complexity, brutality and the pains of war in Algeria against French occupation. In the 50 years since its release, Director Gillo Pontecorvo’s thrilling but tough documentary-style depiction of Algeria’s fight for independence has had a huge impact on all kinds of filmmakers. It also remains eerily relevant because many of the questions the film sought to address around decolonization and national liberation have haunted generations. In many ways, they still haunt the present. The Battle of Algiers focuses on the years prior to independence (1954-1957) and how the French military disrupted the National Liberation Front (FLN) operations in Algiers to some success. The film is based on the memoirs of Saadi Yacef, a former FLN military commander. Yacef relived his experiences by portraying the character of El-hadi Jaffar, alongside a cast of other non-professional Algerians. It meticulously demonstrates the grittiness of urban guerrilla warfare, highlighting the nature of the clash between the FLN and Algerian people against the French Army. It details the tactics of the revolutionaries like secrecy, manipulation, bombings and the evolution of the resistance. While also showing the French military counter-insurgency tactics like torture and killing of civilians. The greatest art is able to stand the test of time because of how it continually excites people, inspires people and makes them think. The Battle of Algiers is a poignant telling of a particular event that effectively depicts a colonial imperialism, which can be seen as an allegory for political events which we still witness today across the world. The film raises interesting questions about colonialism in regards to the French, who at that point have occupied Algeria for more than a century, maintained all its resources and considered it home. There are fascinating parallels to the likes of spiralling conflict between Israel and Palestine. 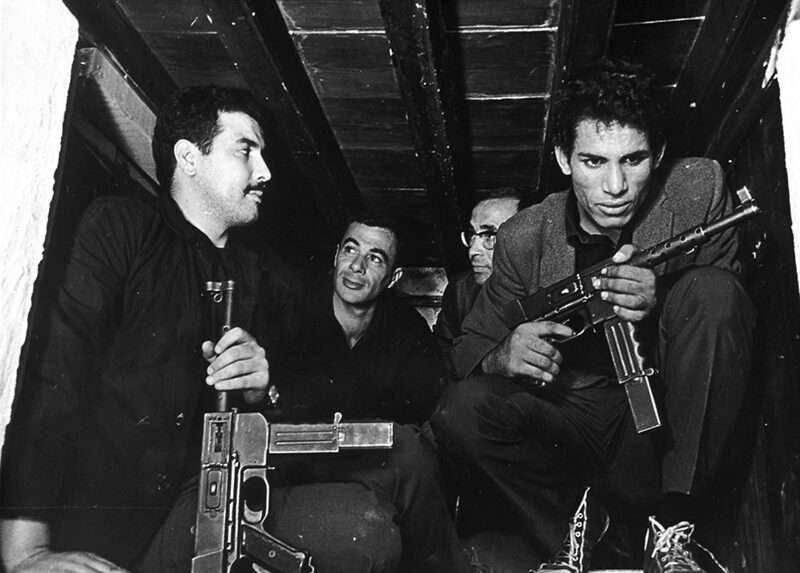 When the Algerian freedom fighters rise up to take on their actions against the French colonizers, we look at their struggle and willingness to die at whatever cost 50 years ago in the same way as Israel and Palestine today. Should the various groups who take up arms, whose actions result in the death of innocents, be branded ‘freedom fighters’ or are they ‘terrorists’? This is the exact same debate that rages today. It’s not too far a stretch to also draw similarities of the ownership struggles in this film to the political climate in South Africa, where the parliament recently passed a notion that could lead to the seizure of land from White farmers that was originally taken from Black people over a century ago. Watching The Battle of Algiers in 2018 is both a fascinating and disturbing experience because the film shows brutal scenes of random bombings, military torture and rebellions which look like news footage that we see on TV every day. The realistic aesthetics effectively show the brutality of war in scenes when guns are fired, bombs detonate or the camera shakes, which makes it feel like the events actually happened and tragedy was spontaneously recorded; there are close shots of bloodied bodies after a bombing that make every single death count. One of the most iconic scenes of pure tragedy in the film is when a woman plants a bomb in a bar and she looks around at the crowd, obviously thinking about how in a few minutes they will all be dead and we get a shattering close up of a baby eating ice-cream. But the story in The Battle of Algiers neither demonizes nor praises either side of the war and instead aims to reveal just the ugly facts objectively. We watch three women sneak through the crowds, and plant bombs in public places that kill innocent civilians, but the movie isn’t saying this is right or wrong; it’s asking you to think about the desperation that drove these ordinary people to commit such acts. The French aren’t depicted as pure evil either, despite their torture and killings; their representative Colonel Mathieu (played by Jean Martin, the only professional actor in the cast) expresses admiration for the rebels. This balanced perspective explains why the film was closely studied by the Black Panthers as a training manual and roadmap to resistance upon its release. It also explains why, in 2003 following the invasion of Iraq, the Pentagon infamously screened the film for the US military as a means to strategize the war on terror and counterinsurgency. Despite this, there is no denying that the film ultimately supports the rebel forces more than the French, because it documents a revolution that ended up being successful. 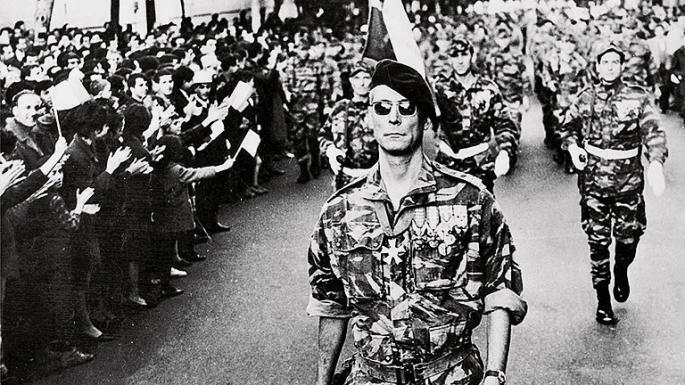 The Battle of Algiers has not only stood the test of time because of its politics but also for its aesthetics and form. Since its release, the film has evidently influenced contemporary filmmakers who have used Gillo Pontecorvo’s hyperrealist style to give a sense of urgency and immediacy to everything on screen. It has been used as a point of reference in all kinds of films- the use of shaky handheld camera in Jason Bourne movies; re-use of Ennio Morricone score in Inglorious Basterds; and the political maneuvering in Zero Dark Thirty. Pontecorvo has been an influence to several directors ranging from Steven Soderbergh and Mira Nair, to Spike Lee and Ken Loach, who have cited personal significance of The Battle of Algiers as a major inspiration for their films. Gillo Pontecorvo never made a film quite as notable as The Battle of Algiers- he went to Hollywood and made Burn! ; another anti-colonial film starring Marlon Brando, which turned out to be a massive flop. But his reputation can rest securely on this single piece of work. The Battle of Algiers regularly shows up on lists of the greatest war movies ever made, and indeed the greatest movies ever made, irrespective of its genre. It’s hard to disagree with its canon status because the film remains not only a landmark of monumental filmmaking but also a template for historical and political resonance. No matter what continues to happen in the world, The Battle of Algiers will remain relevant as long as people are being oppressed and standing up to Imperialist powers. The Battle of Algiers — Algeria/Italy. Dialog in Arabic and French. Directed by Gillo Pontecorvo. Running time 2hr 1min. First released August 1966. Starring Jean Martin, Saadi Yacef, Brahim Haggiag and Tomasso Neri. J’ai le même ressenti que leurs anciens qui étaient au FLN car la France est colonisé par les arabes, les musulmans et les africains . Il paraîtrait que je serai raciste ? 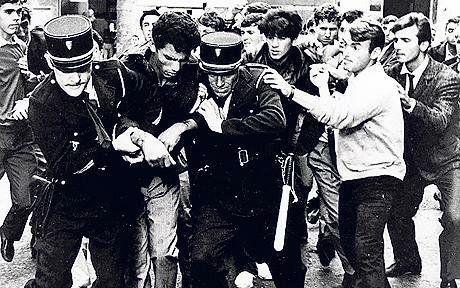 A mon avis je suis patriote, français de souche mais je n’ai pas le courage du FLN algérien de 1961 , je suis trop pacifique ou lâche . L’Europe devrait prendre conscience de sa colonisation par l’Afrique noir et arabe et de tous les musulmans du monde et penser au moins au début comme e FLN algérien.